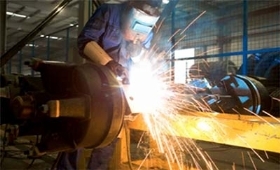 Industry lobby Ficci on Monday said that India's manufacturing sector outlook improved slightly during the first quarter (Q1) of the current fiscal. The latest quarterly survey of manufacturing sector showed that percentage of respondents "reporting higher production" in Q1 increased vis-à-vis previous quarter. "Ficci survey suggests that the percentage of respondents reporting lower production has reduced considerably over the previous quarter, thereby indicating a more positive outlook in months to come," the survey said. "The proportion of respondents reporting higher output growth during the April-June 2017-18 quarter has risen slightly from 47 per cent in January-March 2016-17 to 49 per cent." The survey disclosed that percentage of respondents "reporting negative growth" came down to 17 per cent in April-June 2017-18 from 27 per cent as reported in the previous quarter. "However, the cause for worry was the rising cost of production (for a little over two-thirds of the respondents)," the survey noted. "The cost of production as a percentage of sales for product for manufacturers in the survey has risen significantly as 69 per cent respondents in Q1 2017-18, against 60 per cent respondents, reported cost escalation in last quarter. This is primarily due to rise in minimum wages and raw material cost." In terms of exports, the survey pointed out that Q1 outlook had marginally improved as percentage of respondents expecting a fall during the quarter under review came down from 22.8 per cent in Q4 (2016-17) to 18.5 per cent. "Hiring outlook for the sector remains subdued in near future as 73 per cent of the sample participants in Q1 2017-18 said that they are unlikely to hire additional workforce in next three months," the survey said. "However, when compared on a sequential basis, this proportion reflects a mild improvement over the previous quarter when 77 per cent of the respondents were reportedly averse to hire additional workforce." In addition, the survey predicted moderate growth in metals, leather, footwear, machine tools and capital goods sector during the Q1 2017-18. "Low growth is expected in sectors like chemicals, automotive, textiles and cement. Only in case of electronics and electricals high growth is expected for Q1 2017-18," the survey said.